Sun When You Want It, and Shade When You Need It! we are dealers for fOUR adjustable roof/pergola companies! We specialize in adjustable shade, and believe your backyard should be your oasis, a place to relax and get away from the outside world. Maybe you want the ultimate backyard for your family, and to entertain guests, have huge parties, cook outside, or just relax in your pool or hot tub. We Have a Passion for Backyards! We believe it to be the BEST LR in America! Sundance (by Rain-Out) is the latest LR system in the market, developed by louvered roofs experts with over a decade of experience who set out to create the best louvers in the world, and they have! Sundance has the best warranty in the industry, the best louver in the industry, and the best louver look and action in the industry! Sundance is on track to set a new standard in louvered roofs! Cardinal louvered roofs are made in the USA from high grade extruded aluminum and provide sun & rain protection like the other systems. built like a traditional pergola, their design and features are unique. Want to have a swim in your pool, have a nice family barbecue, or just relax after a long day but it's JUST TOO HOT to enjoy your backyard? How many times have you had friends over for an outdoor party but RAIN forced the party inside? We have the solution! You need an ATTACHED or FREE STANDING Pergola with our Louvered Roof System over your grill, deck, pool or patio! Unlike canvas, plastic, or wood roofs; Aluminum Louvered Roofs can drop the temperature under the roof by 10-15 degrees!! Why, because Aluminum deflects the sun’s heat better than any other material! The SOLARA Louvered Roof System is also the Most Affordable in the market. Want a roof system for your entertainment area like NO OTHER? My Amazing Yard is THRILLED to introduce SUNTECH to America! Designed for Residential and Commercial applications alike, the extensive Suntech product line will make your home or business location stand out against all other roof shelter systems in the entire USA! Suntech is a European company founded in 1976, and My Amazing Yard is thrilled to be one of their ONLY Dealers in the USA and market these amazingly affordable shade products! The Suntech Aerolux louvered pergola system opens & closes AND RETRACTS! NO OTHER Company in AMERICA can offer you these Amazing products that are sleek, modern, and surprisingly AFFORDABLE! Every Suntech Model OPENS & CLOSES, giving you the flexibility of Sun or Shade whenever you need it! If you like the look of our aluminum louvered pergolas but just can't justify the expense right now, you can have a Four Seasons aluminum pergola with or without lattice. These Pergolas are made from rolled aluminum stamped with a woodgrain texture. This allows you to enjoy the Pergola look and feel now, without the maintenance of wood! If adjustable shade and rain protection isn't as important to you, but you still want a Pergola to provide some shade and especially some cosmetic improvement to your outdoor living space....we have your solution! The My Amazing Yard Aluminum Pergola from Four Seasons provides the beauty and design you desire and the longevity of aluminum, all at a price you can afford. Want a Pergola or Patio Roof That's Solid? The Four Seasons Aluminum Patio Covers have a unique aluminum composition that offers comfort, peace of mind, and long lasting durability. Enjoy all the benefits of a traditional wood patio cover with little to no maintenance, complete weather and insect resistance, and unsurpassed durability. Because their patio covers are made from thicker aluminum than their competitors and a primer is baked on before paint is even applied, Four Seasons Aluminum Patio Covers are in our opinion, the best bang for your buck. With a Four Seasons Aluminum Patio Cover, rest assured that your investment will not only look great and add visual appeal to your home, but will also stand the test of time. Four Seasons is so confident in their aluminum patio covers that they offer a Limited Lifetime Warranty on all of their products. Four Seasons roofs are available as attached roof systems or free standing pergola systems. Optional Illumaview panels allow some light to shine through as well, but without direct sunlight. Most people prefer to enjoy their patio in the afternoon or early evening. However unless your back porch faces east, you're probably roasting as the sun nears the horizon. Our solar shades are a perfect solution to sun, wind, side blowing rain, and even bugs. You can definitely find cheaper screens from other vendors, but no product matches the quality and innovative design of My Amazing Yard's Solar Screen product line from Sunesta. 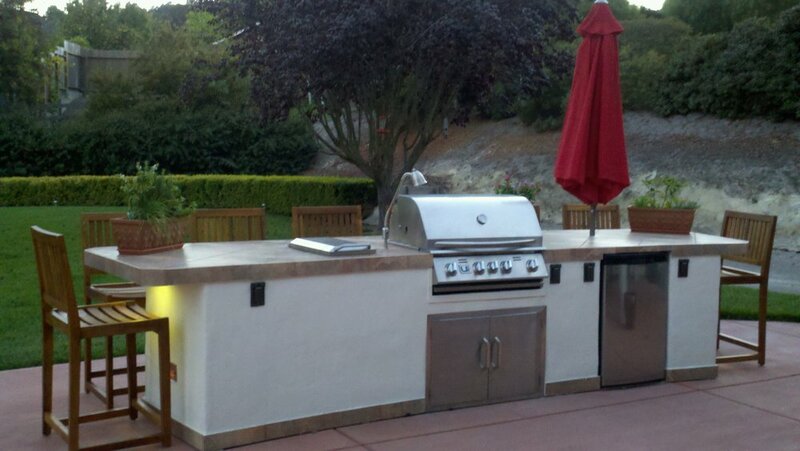 If you're in the market for a big outdoor kitchen but don't have $30,000 to spend? Look no further! 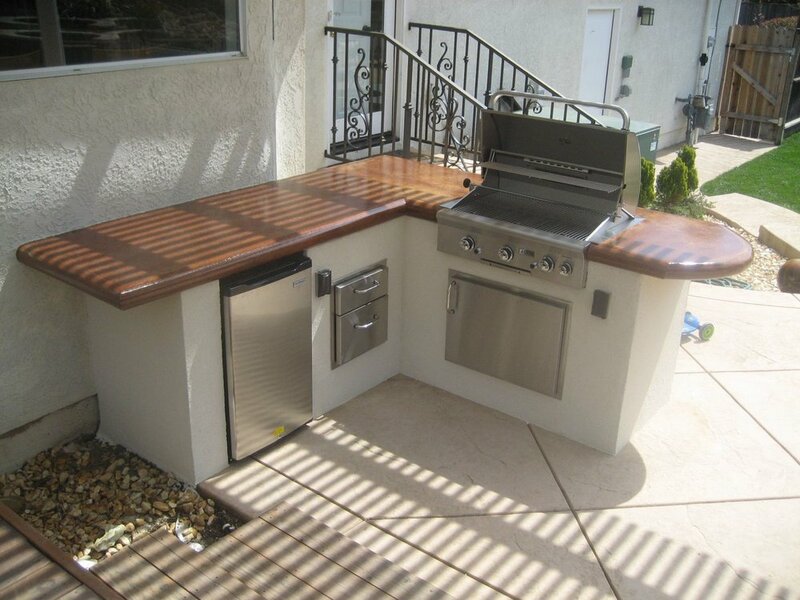 My Amazing Yard can create any size ODK with custom built aluminum framed cabinets! Once we agree on the dimensions, appliances, and doors/drawers (all of which we provide)...then your cabinets are framed out by our supplier here in Florida, and delivered to your house and setup in a half day! My Amazing Yard is now THE Florida Dealer for these exotically modern outdoor kitchen models from FESFOC Barcelona! In the Catalan dialect of Barcelona fesfoc means “let’s do fire”! In a world in which avant-garde and technology do have an important place in our life, Fesfoc has been created to fulfill the market requirements. The contemporary minimalist design of their products integrates easily into the more sophisticated environments. Their barbecues are entirely fabricated in Spain with the best quality materials for a longer durability. They are thoroughly designed so that its lines combine harmonically with your architecture and landscape.